Here are just a FEW of the testimonials that we have received from our customers. Read below to find out exactly what our customers had to say about our customer service, product, and shipping. These are REAL customer reviews. We appreciate EVERYTHING our customers have to say about our product. "SilaLive has done some wonderful things for me. I purchased this product on January 4, 2013. Since then I have seen my blood levels decrease by 10 to 15 points each time I test. I test twice a day every day. My A1C (a blood test taken every three months to check glucose levels) went from 5.9 to 5.2. Also I now have increased energy and stamina. I have a bowel movement after every meal (3 times a day). And the biggest improvement - my cholesterol level have increased and decreased were appropriate. Thank you Silalive." "I've taken the product for 3 months now. Best thing I have ever done and my overall health has drastically improved." "Hello SilaLive, Like I told you before I notice an improvement of my hair since I started taking silalive for 3 weeks and now I think it is working for me. Thinning of my hair stop and now is shinny. My throat is also improving not like before it is always scrachy so that means my immune system is improving. Thank You!" "It is one of the best supplements I've taken. I think the true benefits in it are no only the diatomaceous earth but also the Organic Silica that it is combined with as well as the process and steps they take to clean the food grade DE"
"We've been using SilaLive for to detox, we live in an old house with a lot of lead paint, and so we want to give our children the best shot at getting rid of those heavy metals. All the research which we have read points to the Silca & Diotomatious Earth combo, as found in SilaLive. And we are all feeling really good about taking this supplement." "I love SilaLive! I started using it to see if it would help with the adult acne I have struggled with for 30+ years. After 2-3 weeks I thought there was some improvement so I purchased a 2nd container. By the 6th week there was no doubt it was helping. The flare ups were way less frequent and much milder. Then I noticed I had fingernails! My nails have always been soft and very weak. They never grow long because they peel, chip and break off. Before when I pressed the ends they bent very easily. Now they are very strong and will barely move. What a delightful bonus! I mix the SilaLive in grape juice (also very good in ginger ale or sprite) that I take before bedtime for back pain. I found that this helped also to regulate my bowel movements. Loose and easy every morning like clockwork! Recently I ran out of SilaLive during a busy spell and didn't take time to get more. BIG mistake! The acne flare ups returned full-force, my beautiful nails all broke off and bowel movements were scattered at inconvenient times 2-3 days apart. I will not let that happen again!" "Oh my! Here's another testimonial for SilaLive. Mixed SilaLive in my face makeup this morning. Usually by now my face would be very oily and in need of a touch up. There's almost no oil at all!!! I've been looking for/experimenting with products for 30+ years with no success! Awesome!" "Well I have been taking silica for two weeks and already my hair is beginning to grow and I just took my blood pressure it was 117/70. Thank you so much for silica"
My hair, skin and especially nails are much improved.. I especially notice the difference with my lower back - that had been stiff for a long time. No amount of stretching, exercise or other natural protocols would work.. within 2 wks - all pain is gone. I search the world for my health supplements..and am a fanatic to say the least for the maintenance of my health... I am so grateful that I found your wonderful product. I love the website - so much info - you have a customer for life!!!!!!" "Hi, wow you really do respond quickly. I take 2 large tablespoons twice a day and then the container usually lasts 2 and a half to 3 weeks. I have noticed my nails and skin and hair have really improved I can imagine what it has done for my internal health. It will take at least 6 months to a year to clean up all the toxins that have built up in my organs. I am really looking forward to the day where I can wake up and not feel so sickly. Your product is by far the best towards better health and longevity. Thank you from the bottom of my heart, I'm already starting to feel alot stronger and maybe one day I can leave my apartment and have an ounce of quality in my life. Congratulations on this amazing breakthrough towards better health." "My father is getting good relief since he started taking this medicine, now he is able to do walk, before he find it very difficult. His joint flexibility has improved too. 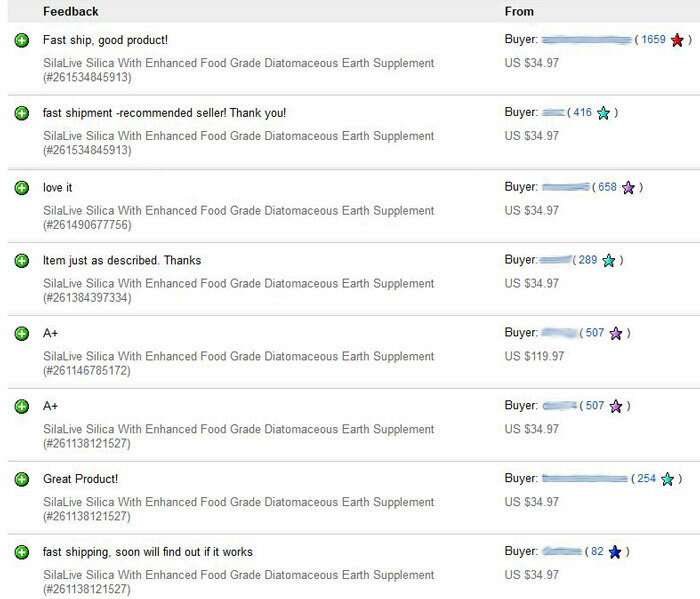 Thanks very much Silalive"
"I ordered Silalive because I was growing calcium deposits on my feet and read somewhere online that this would help. I have only been using the product for 2 weeks now and have already noticed that I no longer need any caffeine products in the afternoon. I no longer feel drowsy throughout the day. My fingernails are also noticeably longer. I have always had short and fragile nails. I love the idea that it also works as a detox! It has so many benefits. I am still waiting on the calcium deposits, but I figure that may take a little more time. The product tastes great and is easy to use!" "I would like you to know that my life has changed drastically since I started taking this. I am 59 years old but have skin that looks younger than a 29 year old. My body use to hurt everyday when I would wake in the morning. Now I have no pain. My husband seen how well it has made me that he started taking it too! He has gone from two medications for blood pressure to one since he has taken this! I am amazed how well it works! I would not live without it. Great stuff! Thank you for providing this product." "I've had health issues the last 20 plus years,I'm 56 years old. Long story short I reserched a lot on the internet & tried a lot of products as I felt something was wrong & the Dr. kept insisting theres nothing wrong its all in my head! Yes,it was in my head, my head did not feel right! Depending on what I ate something would fly into my head like a rush of brain fog or it would literally hurt,problem was I couldn't always determine what it was & I ate a good diet,no sugar, lots of fresh organic (where possible) veggies & fruit, no wheat & good quality meat sparingly. I had had giardia & hookworms which I got living in a 3rd world country, but I got rid of those.I went through a candida yeast program & also did a candida fungus cleanse. Just a couple months ago I stumbled on a youtube video of the silalive & something about it made me want to try it & I'm really glad I did! I've been on it ever since & gradually it seems my health is coming full circle! My health is finally coming back to where it was when I was 30! My skin is becoming tougher & my complexion is clearing up,the arthritis in my knees dissapeared, my bowels move a lot better, different things I can eat again that I couldn't before (I'm not talking about junk foods) but perfectly good healthy food that just reacted inside my body when I ate them for seemingly no reason at all! That was like having a constant pepple in my shoe & having that clear up is so amazing for me! I definitely will not be without this product if I can help it unless I get so well that I won't need it! I gave a can to my daughter already & I want to give to more in the family as I think everybody can benifit from taking silalive! Keep up the good work guys!" PS...I just got 2 of my friends to finally try it – they see my ageless skin and really thick hair and wonder what I’m doing....your silica is the best!!!!" "I honestly have to ay, the first 2 days, the bathroom must have been my best friend on the go, lol. I fell into the grasp go this supplement and it really detoxed my body. I felt so GOOD, like I had for energy, felt brighter, lighter, and more relaxed. I told everyone I knew about this, especially the ones who had physical problems because I know mine vanished within less than 2 days, completely. I must have more, I miss it and it misses me. I also found it very helpful when it comes to working out, this results from the oh so nice complements I get every now and then haha. Thank you so much! I support your business 100%." "I want to let you know how much I love SilaLive! I am about to finish my third container and I have seen improvement in my skin texture and hair. I will be having blood work done prior to my next doctor visit and am curious to see the effects. I feel healthier taking SilaLive and look forward to additional health benefits with continued use. Thanks for a great product!" "I've been using your product for a week and let me tell you I feel great! more energy. I love it." "In 2012, I was diagnosed with breast cancer. I went through chemo, radiation and two surgeries. Slowly, I have become stronger but not to the point of being able to resume my previous life. 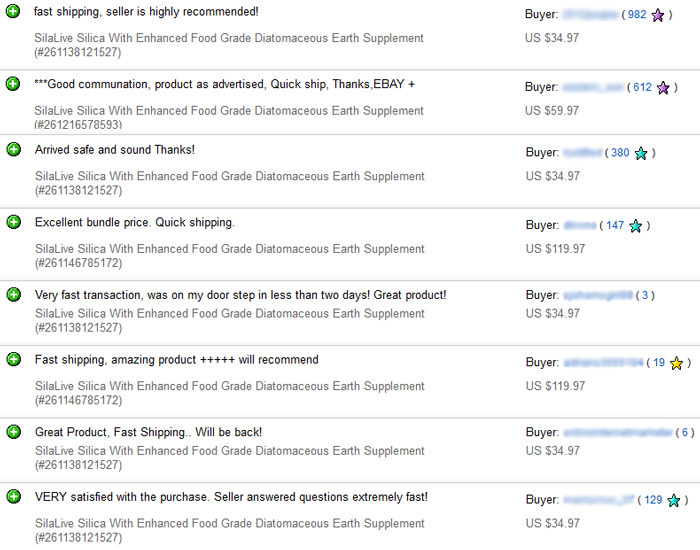 I discovered diatomaceous earth from a friend and have used it now for several months. But I read your reviews and information and decided to order your product. In just two weeks of using SilaLive, I am amazed at the energy I now have. For the first time in years, I feel good. My blood pressure has returned to normal and I am no longer taking medication for hypertension. I have even started biking. It is so exciting to be on my way to feeling like myself again. This product is quite amazing! It is rejuvenating me.Thanks SilaLive!" I am on my second container of SilaLive and it is everything and more what I expected in such a short-time-frame. My first order was for one container and I was totally not expecting the results I experienced... more energy, better sleep, no more afternoon-naps, hair texture and nails improved greatly... regular bowel movement which is a PLUS for me and NOT tired anymore. This product is still working its wonders on me and to those on the sidelines wondering, SHOULD I, to them I say... Just try one container and enjoy the results!!! Thank you for such an INCREDIBLE product!" Adapting Mother Nature's truly unique natural-healing modualities, we can activate the body's innate self-renewing processes the right way for wholeness and restoration. 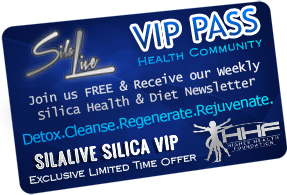 SILALIVE Silica's purity is in perfect coorespondnce and alignment with Nature by delivering a Premium-Human-Grade D.E. Supplement sourced with 100% Pure, Natural, Quality Ingredients (cleansed & micronized) designed to help regain youthful vitality and vibrant energy. 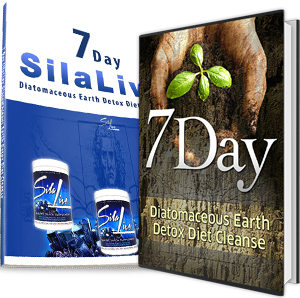 Get 7 Hidden Diet Tips for Instant Life-Changing Detoxification, Cleansing, & Beauty in Just 7 Days! *Statements made on this website are not meant to replace advice received by a qualified health professional. Statements should not be taken as medical advice or diagnosis as they have not been evaluated by the Food and Drug Administration. * This product are not intend to diagnose, treat, cure, or prevent any disease.